OK, LIne6, I get it. You are extraordinarily enamored with your red/black color scheme for the Amplifi product line. For sure, that is good marketing and instantly identifies the product. Nice touch. Understood. However, are you really foresworn to push those colors all the way through the entire Amplifi Remote app, completely oblivious to the problem of user ergonomics? Even when text is involved? You have got to be kidding. Form trumps function to the max here. No design class I ever have attended has suggested that black type on a dark red background in 3 point size is great ergonomics. You literally cannot read anything, for goodness sake! Even when the screen is saved and enlarged, you still cannot read the text! The problem is acute at the top of the screen with the tabs within a mode, and the bottom of the screen with the app modes themselves. Look. I love your Amplifi product. I actually love the remote app in general. But I am begging Line6 on my knees for a better Amplifi Remote screen color layout on the iPhone. No black text on dark red background in 3 point type! If we just have to have the dark red background, please change the text color to white or yellow or something that is actually readable! And can you please enlarge that point size just a bit in most fields throughout the app? I love your app, but using the app for more than a few minutes is driving me crazy and blind on the iPhone. The user interface can be better. Don't let form trump function in such a non-sensical way for visual ergonomics. I have no trouble at all reading anything in the app. Been using it for over a year with no problems (with reading) at all. Perhaps you need glasses or contacts. Or maybe an iPad. Pretty much ALL of the text in the app is white, with the exception of the bottom toggles (which are red on red) and the top bar, of which only one is black (the one selected. The other is red on red). Anyway, for what it's worth, you can switch back to the original layout and colour scheme in the app's settings. You are fortunate to be able to read the small print with its terrible contrast (red/black, black/red). Good for you. However, you ignored or misdirected most of the specific comments in my post, which was not helpful. (1) My eyes are fine; I do not wear glasses; I have no acuity problems; and I have no restrictions on my driver's license. Would be silly for me to post comments critical about small text elements hard to distinguish on an app interface because of non-ergonomic dark color on dark color text and background arrangements if my eyesight were not normal. Thanks. (2) The problem is not visual acuity to begin with, so your comments about perhaps needing "glasses or contacts" is simply condescending and completely off point. The problem is visual ergonomics, not visual acuity. I even posted a screen shot at 300% enlargement to illustrate how the ergonomic problem still exists even in that abnormal state, much less the real world of an iPhone screen. (3) I already made clear that I was restricted to an iPhone as my iOS device interface. Perhaps you use an iPad, and matters are better on that device. I would not know. Suggesting getting an iPad to solve the problem is cavalier about cost. (4) I did not complain about the white text portions of the app in the first place, because they are fine. Mentioning them is an unhelpful misdirection to the specific portions of the interface I actually critiqued. (5) I was explicit that the parts to which my observations applied were what you redundantly reiteratedâ€”the top tabs within a mode and the bottom icons for mode selection. Indeed, I agree, those are the problem areas. Thanks for the "what it's worth" comment about the original layout, as, in fact, I will give that a try. Since the app has no user manual (another problem for a newbie trying to go deeper, even with the nice videos that at least get you started), I was not aware of that option. #1 - I was suggesting you need glasses, not that you wear them already. I have 20/20 vision, and I have no problems reading the text in the app, whether on the iPad or the iPhone. In fact, it could be smaller and it would still be readable. #2 - You said "even enlarged, you still cannot read the text". That's just absurd. Not only can it be read at regular size, it's even easier when enlarged. You should also keep in mind that the display on the iPhone (4 and up) was designed to be viewed best at a distance of 10 inches. #3 - You said nothing about being restricted to an iPhone as your only device. And considering that the Amplifi Remote app was designed to mainly be used with the iPad (as evident from all the promotional material), it's not an unwarranted suggestion. The idea that my suggestion to try an iPad was being "cavalier about cost" is laughable as well. Especially considering you can get an iPad for less than the price of the amp. #4 - You said "No design class I ever have attended has suggested that black type on a dark red background in 3 point size is great ergonomics." There is literally 1 word that is in black text. All the other text is either white, or red. Mentioning that fact isn't "unhelpful or misdirection to the specific portions" you were critiquing. Implying that there are portions of the interface that contain black text is misleading. Again, there is 1 word in black text. #5 - We don't agree, since to me those areas have no problems at all. By mentioning them I was pointing out that the text is red on red, with the exception of 1 word. Anyway, there's no point going back and forth. Clearly you're not comfortable with anybody disagreeing with you. Try and enjoy the app for what it is. 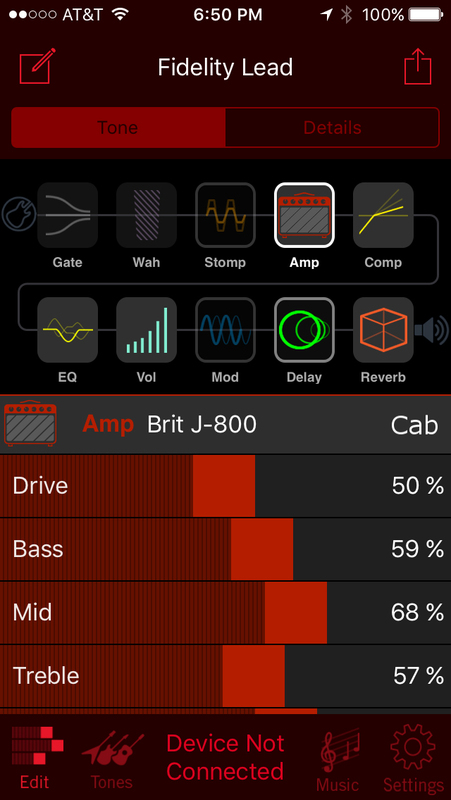 One of the Line 6 reps mentioned a little while back that they might consider adding new themes to the app in the future. Maybe they'll give you something you like better. But I wouldn't get your hopes up. Browse through the forum and you'll soon find out that Line 6's customer support isn't great and that changes and updates are slow to come. Besides, I'm sure after using the amp for a little longer you'll find, as most of us have, that there are many more concerning problems with the Amplifi amps and the Remote app than the text size and colour. For most of the users here, this amp and the app have been a pretty big headache. Please. I am not uncomfortable with "anybody disagreeing" with me. Good grief. What is a forum in the first place? I want to make sure I have communicated my actual point. Your response seemed to indicate I had not, so I tried again. Words we type do not necessarily communicate the thoughts we think as well as we assume. So, sometimes one has to re-say what one is trying to say to overcome the difficulty. I was trying to re-say what I had said at points I thought I was not communicating or where I thought the response was not helpful. Again, I am not talking visual acuity, but visual ergonomics. I did talk about "reading" the text, which is where I think I was not clear based on your response. For that I apologize. Of course, if you read carefully, you can read the text. That really was not my point, so I regret not being clear what I meant by "reading" the text. By reading I meant easily recognizing specific words instantly, which is ergonomics. In the screen shot, you have multiple instances of black type on dark red background or dark red type on black background. In these instances, the brain has a much harder time processing the visual data, and the reason is simple and well knownâ€”because the contrast is low. Not that the brain cannot eventually process the data (read the text); the brain simply has to work harder to process the data (recognize specific words more quickly). Another illustration about this type of readability (high contrast for word recognition in brain processing) is in marketing. That is, you rarely see low-contrast color combinations, such as dark red on black or black on dark red, with text in marketing materials in print, or advertising on TV, or even on large billboards on the road. I had hoped supplying a screen shot would help illustrate this principle of readability, that is, the areas of extremely low contrast on the screen shot that reduce readability. At the top of the screen, when a tab is selected, you have black type on dark red background. When a tab is unselected, you have dark red type on black background. Both combinations create extremely low visual contrast. Then, at the bottom of the screen shot, if a mode is unselected, you have dark red type on black background. Selected, however, is red text on black background. Again, both combinations are low contrast colors. You said, "There is literally 1 word that is in black text." In the given screen shot example, yes, that is the selected tab named "Tone." The black text, however, would be for any selected top tab in any screen. Thus, your "literally 1 word" emphasis is not really on point and misleading. In the app, the top tabs on any screen when selected are black text on dark red background. Thus, in the very next "Tones" mode, you have four tabs at the top ("My Tones," "Favorites," etc.). Select any one of those four, and you have four times on that screen when the color combination goes to the low-contrast black text on dark red background. So, "literally 1 word in black text" is true about the static screen shot, obviously, but is not a comment that recognizes the actual point about the overall app interface ergonomics I was making about the particular dark red and black color combinations. Further, the opposite combination for the unselected tab on any screen, dark red text on black background, is, as well, low contrast too, so still makes the point. So, either way, selected or unselected, the top tabs are low-constrast in any combination of selected or unselected, so low contrast and not easily read. I also am not aware that any top tab or bottom mode icon is a "red on red" color combination (your point #5). The top tabs are black words on dark red background (selected) and dark red words on black background (unselected). The bottom mode icons are red words on black background (selected) and dark red words on black background (unselected). My point remains. High contrast makes text more readable. If that principle does not seem obvious, OK. We disagree. I also recognize the more concerning elements of the hardware and app. That is why the principle of good visual ergonomics would seem so easy to fix in the first place. I am asking for what I consider an easy fix that I think would truly help the usability factor of the app, not trying to conquer a whole continent. Since I am a newbie to the forum, I had not yet caught on to the general perception that LIne6 changes and updates are slow. Such inertia on product development would be disappointing, without doubt. Sorry to hear that. BTWâ€”I did not see anything in the "Settings" mode that allowed for any other interface color combinations. I guess you would have been referring to reverting to a previous version of the remote app to get a different skin to the app? So maybe the problem isn't your vision. Maybe you're colour blind or you don't have the brightness on your iPhone screen turned up high enough. Both the top tab and bottom tab have red backgrounds, not black. In fact, both the top and bottom have the same red (it's actually closer to maroon). The only major difference in colour between the top and bottom tabs is that the text in the top tab is contained within a red box when selected. The only parts on a black background are the contents of each tab (or the centre portion if you will). And yes, overall there are more than 1 instance where black text is on the screen. But only 1 word at any given time. I guess I could have been clearer about that. The get the old layout you have to go into settings and turn off "Use Tabbed Navigation". That will give you the old layout that was used with the app before the 2.5 update. However, this will also change the layout of the entire app and then you're really going to hate the ergonomics. Thanks for the response. Color descriptions admittedly can be tricky. Maroon can be pretty light or pretty dark depending on exact shade (level of black in the color). So, you may be right. I have attached below a crop of the screen shot of the top tabs in the "Tone"mode. Are you saying the background for the "Details" tab on the right in this crop is a maroon? If so, that would be a really dark maroon. That area is what i am calling "black," but I may be wrong. In any case, whether maroon or black, the contrast between text and background is low, whatever color name is given to the background. Thanks for the help on turning off "Use Tabbed Navigation" to see the other layout. I have not looked at that yet, but I suspect you are correct that the interface would be less desirable. On the bright side, maybe just maybe having that one chance to change the skin already in the app means they easily could add more options in there. Your not color blind and yes red on black is rediculous. I asked for this change when they came out with the first IOS 9 update. They should either give us the choice of colors or use higher contrast background foreground colors.